Last month I told you about our small business programs, and it got me thinking that many people might not be aware of the many NIH programs that exist beyond the scope of the R01. One such program is the Academic Research Enhancement Award (AREA). These awards create hands-on research opportunities for faculty and students at less research-intensive institutions (less than $6M in research and training funds per year). AREA awards provide up to 3 years of renewable funding, with a maximum of $300,000 in direct costs for the entire project period. As you can see, the popularity of this program has grown over the past several years. We received the highest number of applications to date last fiscal year. We have been in touch with AREA-eligible institutions who have helped us hone the program. Starting with the latest review round, we now cluster AREA applications during review so that applications from AREA investigators can be reviewed together. This allows reviewers to focus on the specific goals of the program, which are distinct from the other research grants they were reviewed side-by-side with previously (R01s, R21s and R03s). We’ve also heard your interest in getting AREA-eligible investigators onto review panels. During this past round, we had greater inclusion of AREA-eligible investigators than ever before, in part due to the Center for Scientific Review’s Early Career Reviewer Program. This program specifically targets investigators from less research-intensive institutions. Finally, for those of you applying to the AREA program, either for the first time or for a renewal, I urge you to read the program announcement. It was recently updated with new language to emphasize and clarify the goals of the program for both applicants and reviewers. Applicants should pay special attention to the sections about including students in the research and demonstrating that you have experience supervising students. I think one of the great benefits of this program is the exposure students get to research, so be sure to highlight that in your application. Reviewers will be evaluating not only the scientific merit of your application, but also how you plan to address the program goals of exposing students to research and strengthening the research environment of your institution. This entry was posted in blog, Rock Talk and tagged Award Programs by Sally Rockey. Bookmark the permalink. Will you please, present the same type of graphical information – Number of applications, Number of awards, Success rate – for the NIH SBIR program for the same period of time. You can find similar information on the SBIR program in the NIH Data Book. Its too bad to see that although many more PIs are applying for these types of grants (i.e. AREA) that the funding line has stayed virtually flat. Given the relatively small size of these grants ($300k or less) and the large impact that these awards have on small teaching institutions, it would be good if NIH considered investing more resources into this type of program. Based on comments from AREA investigators and NIH program officers who are actively involved in the AREA program, in fiscal year 2010 the NIH increased the size of AREA grants from a maximum of $150,000 in direct costs to $300,000. In order to make the same number of awards, the NIH committed an additional $40M over the past two years, nearly doubling the budget for the AREA program. The relatively large increase in AREA applications could be the result of the recent doubling (from $3 to 6 million) of the NIH support an institution can receive annually and still remain eligible for the program. I suspect this increased the number of eligible institutions that award graduate degrees much more than it affected the number of eligible undergraduate institutions. I recognize that the AREA program is geared toward students in general, and not expressly toward undergraduate students, but I wonder whether the increased eligibility of graduate-level institutions has negatively impacted the funding directed toward research experiences for undergraduate students (i.e., more funds going to support graduate students rather than undergraduates). I am curious why NIH decided to expand the eligibility requirements for the AREA program, and whether this potential impact was considered. In 2009, we instituted two policy changes to the AREA program. We increased the cap on direct costs from $150,000 to $300,000, and we simultaneously increased the institutional eligibility cap from $3M to $6M. Considering that the institutional eligibility cap had remained at $2M to $3M since the creation of the program in 1985, and we were doubling the cap on direct costs, we considered this an appropriate time to also increase the institutional eligibility cap. Increasing the institutional eligibility cap from $3M to $6M added only 89 institutions to the eligibility list. Of the 89 newly eligible institutions, 31 applied for AREA funding in fiscal year 2011, accounting for a total of 226 applications. The success rate for the newly eligible institutions was the same as that of the program as a whole (15%). 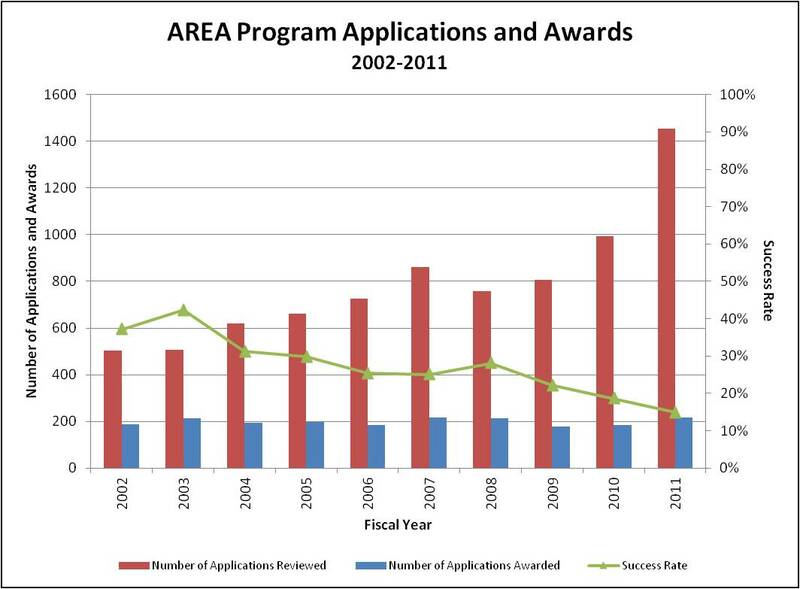 Since the number of AREA applications has increased by 650 since 2009, it is clear that the increased institutional eligibility cap is only part of the equation. We surmise that the increased size of an AREA award is an attractive feature to our new applicants. I welcome the idea of the AREA program, however, if the NIH data is correct more than 20% of 2011/2012 R15s were awarded to Schools or Division at institutions that already have more than $6m in NIH funding. While those school or divisions are “new” to NIH they come from colleges/universities that have high levels of research support. I think that this is not in the true vein that the AREA program was originally intended. I am concerned that the traditional 4 year institution, their faculty, and their undergraduates are becomingly squeezed out of funding from NIH. The changes in eligibilty criteria have allowed for larger institutions with graduate programs and graduate students to apply. In the long run, how can an undergraduate PI really compete with a program with graduate students? This results in the 4 year institutions with their undergraduates becoming increasingly less competitive, i.e., the insitutions and the students with the least resources are likely to get even fewer. It would seem to make sense that NIH consider increasingly the funding level to this expanding program so that the smaller institutions at least have a greater probability of getting funding (and/or partition some of the funds for undergraduate institutions), or they design a program that specifically targets undergraduates.